Other than dry goods, everything for sale on kingsnake.com is illegal somewhere. Reptile and amphibian laws, codes, and ordinances exist at international, federal,state, and local levels. Heck, some neighborhood associations even ban them in their covenants. But it hasn't always been this way. And snakes didn't always come in deli cups. 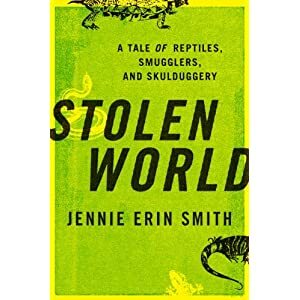 Jennie Erin Smith's "Stolen World: A Tale Of Reptile, Smugglers, and Skulduggery" is a fascinating read that I found both hard to put down, and hard to pick back up again when I did. I can't put it down because it reads like a Ludlum novel, but I am afraid to pick it back up again because many of the stories she relates make me cringe. Back in the days before the internet, before captive breeding, before the word "herpetoculture" existed, and before most of the laws and regulations about reptiles and amphibians were even proposals, there were the snake men. Reptile cowboys who strapped on the boots, jumped in the swamp and wrestled the python into a bag, or a cobra, or a krait, or a mamba. Those men would fly around the world, collect the animals, box them up, put them on a plane, and the animals they acquired would show up at the world's biggest zoos, or in the hands of the few private collectors of the time. It was a loose group of people who maintained their own "internet" based on phone calls, letters, and the occasional mailed price list. There were no reptile expos, no magazines, no clubs, and few organizations open to non-academics. Continue reading "Book Review: Stolen World: A Tale Of Reptile, Smugglers, and Skulduggery"
In an effort to protect Brazilian wildlife diversity and resources, including many reptiles, the nation plans to stop companies that produce products using their rare animals without compensation. Brazil has levied more than 100 million reais ($59 million) in fines since July on companies charged with not paying fair compensation for the use of genetic material native to Brazil, said Bruno Barbosa, who heads inspection for the environmental oversight agency Ibama. Next year, officials will begin pursuing companies that did not notify the government of their use of local species to create products such as pharmaceuticals, as required by law, meaning fines will likely go up. Barbosa says examples of biopiracy abound, such as the development in the 1970s of the hypertension medication captopril from a snake venom that indigenous groups used on arrowhead tips. Pharmaceuticals companies also used the yellow-and-green Kambo frog, found in Brazil's Amazon state of Acre, to create anti-inflammatory drugs without distributing benefits to local residents, he said. Many of these incidents came before a 2001 decree that created the current rules governing species use. While some may feel the laws are overly restrictive, this measure may result in the preservation of what's left of Brazil's native flora and fauna. Who is to blame when a venomous snake bites? News reporters like to make much ado about a venomous snake bite, be it a native or exotic species, but Janaki Lenin has her own take. Of course she also shares it with her husband Rom Whitaker of the Madras Croc Bank. If a snake catcher gets bitten by a venomous snake, it is his own fault. He was careless, most probably trying to show off, and wasn't paying attention. That was the motto of Rom and his snake-hunting buddies in the U.S. during the 1960s, and it still holds to this day. In keeping with that philosophy, anyone who got bit was teased mercilessly. (Non-snake hunting civilians bitten accidentally were exempt, of course.) There is no doubt that this tradition of peer-admonition has kept these men, most of them, alive to this day. In India, however, numerous snake-catchers, invariably young men, brag about their various snakebite “exploits”. One bright spark bagged a cobra in a flimsy translucent bag. When he moved in closer to knot it, the snake nailed him on the hand through the cloth. He was in hospital for a few days, and in the Indian tradition, the entire neighbourhood visited him to express their concern. Basking in all this attention, our man never once paused to think why the incident had occurred. When he bragged about it numerous times, Rom asked him: “Whose fault was it?” The young man didn't seem sure, but it was certainly not his fault, he declared. Rom countered: “If you had used a proper bag to begin with you wouldn't have been bit, right? So tell me now whose fault was it?” The reply was silence. The blame lies with the keeper. In this day and age, however. one careless keeper can spark problems for 100 good keepers. Please be careful; I agree with Janaki that we do not need more Darwin Award winners. When the Gulf Restoration Network and Center for Biological Diversity threatened legal action earlier this year, the U.S. Fish and Wildlife Service stepped forward with a proposal to save the Mississippi Gopher Frog, to the tune of around $100,000. Most of the land is owned by the federal government; 96 acres are owned by the state and 470 acres are privately owned. Mississippi gopher frogs once lived in longleaf pine forests from western Alabama to southeast Louisiana. Timbering all but eradicated those forests. They now live in only a few spots in south Mississippi. Scientists believe fewer than 100 mature adults live in the wild. Five zoos — in Detroit, New Orleans, Memphis, Miami and Omaha, Nebraska — have been breeding or raising them. If this impacts you, the agency is taking comments until January 11, 2011. Israeli airplanes are causing an unnatural mating season for crocs. The good news is that this is a nursery and not wild animals, but it also makes you wonder what might be happening to other species. After the bump, video from St. Augustine when I visited this summer and the gators were calling! Continue reading "Sonic boom romance for crocs"